Mahomood Jamal, trans. and ed., Islamic Mystical Poetry: Sufi Verse from the Early Mystics to Rumi (London: Penguin Classics, 2009). Rabiya al-Adawiyyah of Basra (c.717-801) came from a poor family but rose to fame for her verse, her asceticism, and her obsession with God. Rabiya’s poetry is the first time we find in Islam the idea that God should be loved for His own sake, and not out of fear or to gain entry to Heaven. 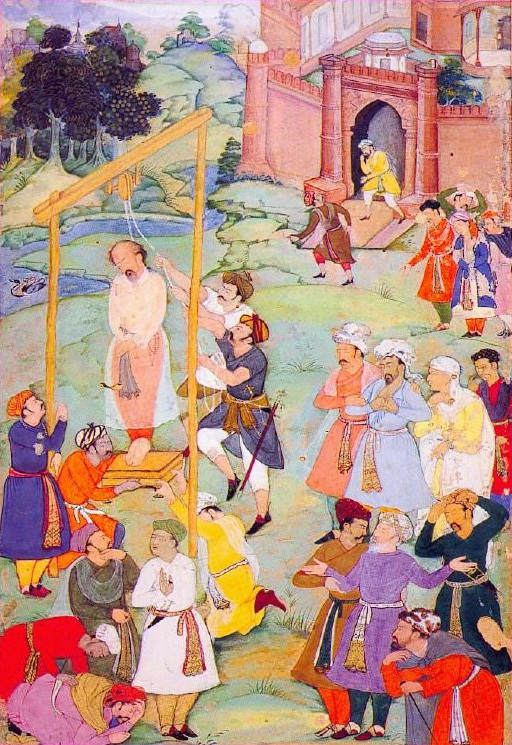 Al-Husayn Ibn Mansur al-Hallaj (c.858-922) traveled widely throughout the Muslim world until he settled in Baghdad, where he was eventually executed. Believing that God dwelt within him, al-Hallaj got in trouble for saying things like “there is nothing in my cloak but God.” They cut him into pieces and then set fire to him. I am at Your service, O my secret, my whispered name. I am Your servant, O meaning of my life, my purpose. Or did You speak through me? O my speech, my sign, my significance..
O my creation, my design, my physical life. You are dressed in my meaning. Once again the object of my desires. And my enemies help me on my way. But love deep in my soul makes me reckless. 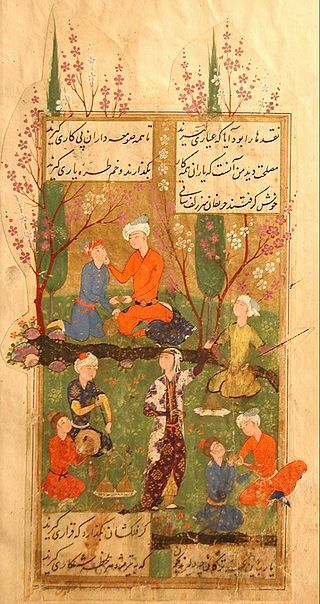 Sanai Ghaznavi (?-1131) was a Persian court poet who left his life of luxury to seek after God. He rejected logic and reason in favor of “awakening” to the presence and love of God in his life. His nature can only be known by Him. Weakness hastened on the path and found Him. Or else no reason or intellect could know Him. How can our mere senses His truth perceive? How can a nut rest on a sliding dome? But only his grace can take you beyond. Like others before you, do not commit that folly. His works are guide and witness to Him. How can you ever know God? How will you know Him as He is? 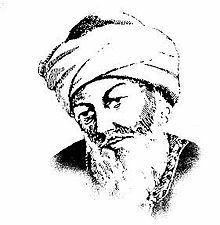 Jalaluddin Rumi (1207-1273) is often considered the greatest poet of the Persian language. 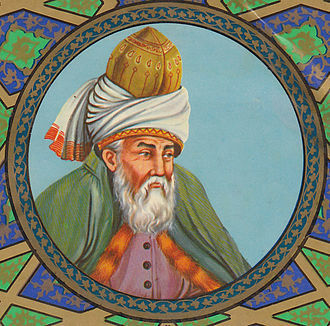 Born in Tajikistan, Rumi spent most of his life in Turkey, where he and his dear friend Shams, a dervish, wrote poetry and sought God through asceticism. A soul to cherish as it has Thy perfume! What need have I for religion or unbelief? What need have I for union or separation? My qiblah and my prayer arch is my Beloved. If not drunk, thus, what need I for drinking? What need have I for heaven and hell, of houris and slaves? What need has he for balm and cures? And in every face I saw my Beloved’s trace. I saw Him in myself. In my beauty, I my lover’s beauty saw. All reason and sense are useless. 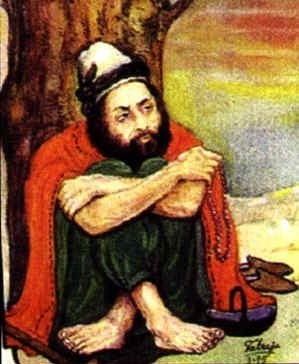 Shah Abdul Latif Bhittai (1689-1752) comes from Pakistan, and wrote in Sindhi. He became a wandering ascetic even though he was born into a wealthy family, and craved the solitude where he could think about God. Kind, gentle, and prayerful, he became famous in his own day for his deep piety and profound wisdom. the mind a bead, a harp the heart. their very sleep their worship is!